Many know about Disney’s idea to change Paradise Pier into Pixar Pier, but what they may not know is that Disney is planning to have many new Pixar-inspired foods to go along with the renovation, coming this sumer. Pixar Pier will have 4 Pixar film inspired “neighborhoods.” A Toy Story Neighborhood, an Incredibles Neighborhood, an Inside-Out Neighborhood, and a neighborhood that is a combination of more popular Pixar movies, according to disneyparks.disney.go.com. Senor Buzz Churros is a kiosk that will be in the Toy Story Neighborhood, inspired by Toy Story 3, where Buzz Lightyear gets rewired and starts speaking in the Spanish language, according to insidethemagic.net. Poultry Palace take out stand, inspired by The Toy Story Toon, “Small Fry,” will be located in the Toy Story Neighborhood. At this stand, customers could also get the Toy Story Toon stars toys, and Disney’s famous Turkey Legs, according to eater.com. A snack stand in the Incredibles Neighborhood may sell Jack-Jack’s favorite cookie, but no one will know what it is until the Incredibles 2 movie comes out in June, according to eater.com. In addition, according to the ocregister, a three flavored corn dog, which is also inspired by Jack Jack, and his shapeshifting powers will be available. The corndog has three parts, a spicy hot like, pepper jack cheese, and cajun chicken sausage. Accompanying it will be a sweet and spicy blackberry sauce. This special corn dog will be at the Corn Dog Castle at Disney’s California Adventure. A sweets shop called Bing Bong’s Sweet Stuff will be in the Inside Out Neighborhood. Visitors will be able to purchase the tears of the beloved cotton candy elephant, according to insidethemagic.net. A hot dog stand called Angry Dogs will also reside in this neighborhood, where one could pick the level of “fire” for their hot dog, according to insidethemagic.net. An Adorable Snowman snack stand, based on the abominable snowman from Monsters Inc will replace Paradise Pier Ice Cream Co. according to disneyland.disney.go. New Lemon dole whip will be available at this stand, based on the snowman’s “yellow snow” snow cones. New Pixar treats will also be available all around Disneyland, Disney California Adventure, and Downtown Disney. At the Lucky Fortune Cookery in California Adventure, will be color changing noodles, inspired by Randall Boggs from Monsters Inc. according to eater.com. Mike Wazowski Bread from the Pacific Wharf Cafe in California Adventure will also be available. At Disneyland, lightsaber churros, a salty sweet chocolate churro with Mexican chocolate, inspired by Coco, a strawberry churro inspired by Lotso from Toy Story 3, and a lemon churro inspired by Kevin from the movie Up will be available, according to eater.com. Many Toy Story treats will be available all around the park. At the Golden Horseshoe in Disneyland, one could purchase a Woody’s boot root beer float, or a Berry Jubilee Funnel cake inspired by Jessie from Toy Story, according to ohmydisney.com. 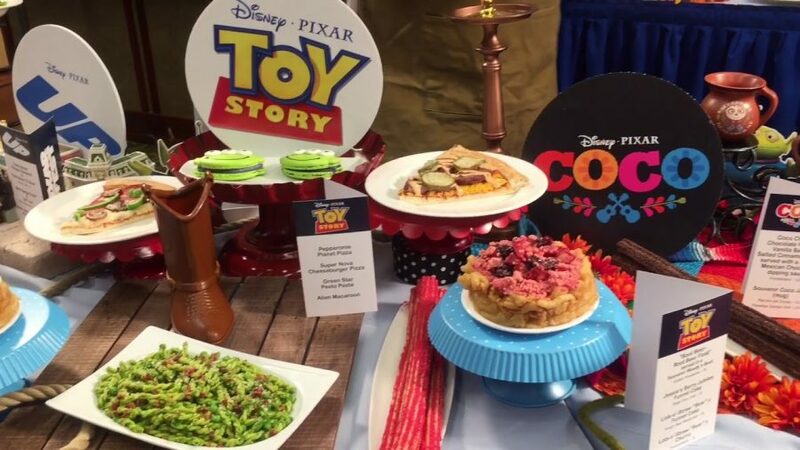 At the Disneyland Resort is a three flavored cake and cake pop, the colors of Toy Story Luxo Ball, and a Super Nova Cheeseburger pizza, according to ocregister.com. Available at Cafe Orleans in Downtown Disney is a three course Ratatouille dinner, with a shrimp ratatouille byaldi and a mascarpone ice cream filled strawberry beignet, inspired from when Remy the Rat speculates on how strawberry and cheese tastes well together, according to eater.com. Enjoy the new Pixar treats.